Debt sometimes feels like being trapped in an avalanche. You look for footholds and places to stop yourself from sliding down the mountain, but finding your grip and climbing back out is tough. You need to pay off debt fast and you need a method to help steady your path. One great payoff method is the “debt snowball” — building up bigger and bigger payments over time…it works great, but sometimes you want a little boost to get a leg up on your debt payoff goals. 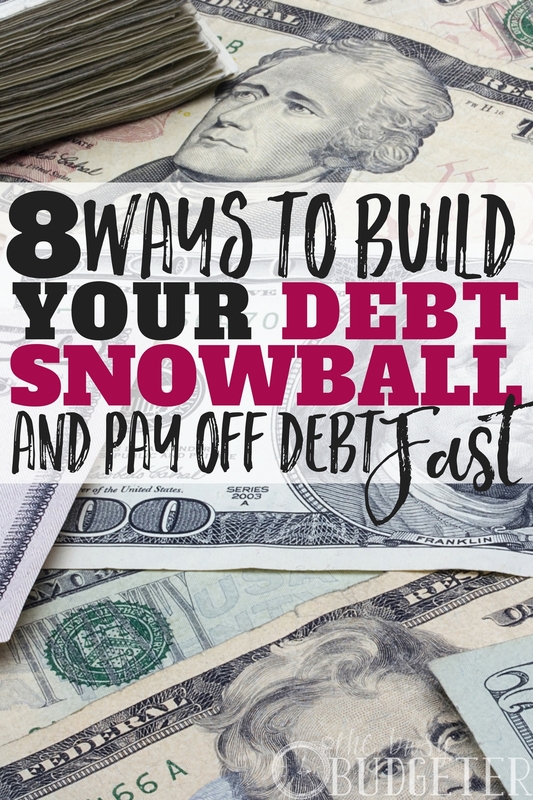 If you want to fast track your debt snowball, here are 8 great ways to get the ball rolling! Those who are familiar with financial guru Dave Ramsey have heard of the debt snowball payoff method. You start paying minimums on all your debts, putting any “extra” toward paying down your smallest debt first. Once your lowest debt is paid off, you roll the extra to your next smallest debt, and so on. This creates a “snowball effect,” helping you pay off debt fast. If you’re facing a lot of debt, the light at the end of the tunnel can feel very far away. 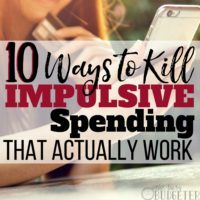 Even if you’ve absolutely committed to not taking on any more debt and you're using the snowball method, there are times when you may want to jumpstart your debt payoff to really get everything moving even faster. Maybe you’re working toward a bigger goal or you're aiming to payoff debt in a certain amount of time. If you want to hit your goal by your deadline, you’re going to need to slide extra toward your debt—but where do you find extra cash, when money is tight? Well, guys, I’m here to help! Here are concrete, solid actions you can take NOW to give your debt the cold shoulder, fast track your snowball and start your finances moving in the right direction! If you’re working on paying off debt fast, the most important step is starting with a well-organized budget. You can’t blindly shovel away at your debt without an end goal in sight. Even if you think you’re paying debts down, you need an end goal in sight so you’re aiming for a target. 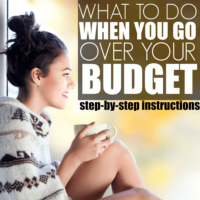 If you haven’t written out your budget, I want you to stop everything and do it right now. Write out your expenses, your bills, debt you’re hoping to pay down and calculate how much you earn each month. Subtract your debits from your income. The difference is the “extra” you’re going to put toward paying down your smallest debt. Once you’ve paid that down, move to your next lowest debt and so on. 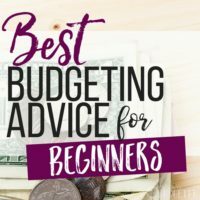 If you need help getting started with a budget, check out our Budget Bootcamp for Beginners. It will help you get on the right track, get used to budgeting and start to see progress. If you’re already working on your debt snowball and following a budget, then you’re on the right track. Watch for areas where you can cut expenses. Check your bills and utilities for any wiggle room. Food and entertainment are often two great targets. Eat at home more often. Meal planning and make-ahead meals will really up your savings game. Find fun alternatives to going out and social activities that don’t cost money. With these little cuts, you will identify flexible spots in your budget. If you want to see real progress on your debt, put any extra windfalls you get toward paying it down. When you get money, no matter what it’s from, don’t look at it as “Yay! Extra money! Let’s party!” Instead, put it toward your goals. 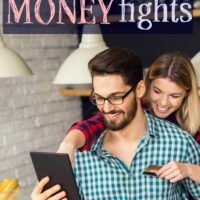 Chunks of money from tax refunds, Christmas gifts, birthday gifts, and other sudden unexpected cash sources are great ways to boost payments, because you’ll see huge progress fast! Each month you eliminate from your debt payoff plan is another step closer to your goals. So, instead of instant gratification, use that cash for long-term outcomes. If you sell big items like a car or even furniture or a videogame console, use that money toward your debt as well. Think of items you don’t need or don’t use often and consider how to sell them and pay down debt. Even if you aren’t selling big items, you can earn plenty of money selling clothes and accessories. Consider selling clothing on consignment. Check with your local shops or look at apps like ThreadUp that allow you to sell clothes online. The eBay app is great and if your items are brand name you can earn decent money. Jeans, vintage t-shirts, boots and designer items have a strong market on eBay. Go through your house and organize as thoroughly as possible. If there are items you don’t need any more, consider selling them. Clean out your cupboards, your garage and your kid’s old clothes and toys. Look at books, movies, videogames and media you don’t use too. For large items, consider selling them on Craigslist or even posting them in a Facebook group or neighborhood group. Having a garage sale is quite a bit of work (and you rarely get a high return), but if you’re part of a neighborhood rummage or other sales opportunity, take advantage! Check out online options like Swagbucks and Inbox Dollars. These sites will pay you for following tasks as simple as watching videos, taking surveys or searching the web. Take quizzes and complete other mini-tasks for money. Swagbucks pays in points or “bucks” which you trade in toward gift cards and other items. Inbox Dollars pays out actual cash (which is nice). The best way to earn on Swagbucks (with the least amount of effort) is to visit the site before you make online purchases, which will help you earn more points. If you earn gift cards, use them to offset other purchases. For example, select a Walmart gift card and do your grocery shopping there and knock the gift card balance off your grocery budget. Don’t just use gift cards as a reason to shop MORE. There are plenty of other ways to earn money online. I might be biased, but starting a blog is by far the easiest, most satisfying and wildly successful job I’ve ever done. I encourage everyone to try their hand at blogging. If you’re interested, I have plenty of blogging resources to get you started. Other options for earning money online are proofreading, freelance writing or becoming a virtual assistant. Proofread Anywhere offers a great course on proofreading. For freelance and virtual assisting work, the Horkey Handbook can’t be beat. Earning money online isn’t as hard as you think. There are many options depending on your level of interest, time and skillset, so check it out! If your town hosts a parade, offers concerts, fairs or even a high school football game, make the most of these events. Get your kids together, pack a cooler and sell water (or lemonade) to the crowds of people passing by. You might think it sounds silly, but on a hot summer day, a $1/bottle of water can earn $20 on a $4 investment. Besides, people genuinely appreciate an ice-cold drink on a hot day. If you get really ambitious, you could sell frozen pops or other drinks, but the best return is on water. If your neighborhood hosts an event, it’s a great time to sell furniture and big items you don’t want to bother with on Craigslist. Just put them out on the curb with a sign, sit on your front lawn and hold an impromptu yard-sale. It’s much less stressful than a traditional, planned out garage or rummage sale, and during busy times you can find interested parties who will pay you to haul away stuff you don’t even want anymore! Win-win! If you’re working on your debt snowball, you can earn money by picking up odd jobs around town. Offer to do jobs you’re good at—fix a computer, help with yardwork or gardening, caring for pets or running errands. You can make great money picking up babysitting jobs for other moms as well. Why should teenagers earn all the babysitting money? Another option is to send out a “husband for hire,” if your guy likes to do odd jobs and is good at small repairs. Often people don’t want to hire a contractor just to hang up pictures, fix a toilet or build IKEA furniture. Make a flyer and offer to help neighbors with their lawn mowing, errands like grocery shopping, picking up dry cleaning and other services. If you’re great at organizing or cleaning, offer to help neighbors and friends who need assistance with chores. It’s a great way to get to know your neighbors and earn extra money on the side. What are your talents? Are you a great singer, do you paint, do photography or crafts? Turn your talents into a class from your home or look for opportunities at your local senior, community or recreation center. They’re often desperate for skilled teachers and teaching isn’t as difficult as you might imagine! Once you’ve planned out a course, repeat the material over and over with new students. You can also consider teaching and sharing your lessons online via sites like Skillshare. Piano lessons, sewing lessons and even dance lessons are fun too, especially with kids. If your students are kids or beginners you don’t need to be “expert level.” You can teach sewing basics or a small craft class from your home easily. You may even want to check with local elementary schools and libraries. They are often looking for assistants with skills to lead after-school clubs and community activities. If you’re crafty, consider making items to sell online or even selling printables, patterns and instructions for others to recreate your designs. Artists can consider designing t-shirts and other items to sell online. There are companies such as Spreadshirt that will print your designs on nearly anything. You earn a profit each time they sell. For a while, before I started blogging I flipped items on eBay. It wasn’t the job for me BUT if you have the right skillset and area of expertise, I’ve known others who’ve made serious bank as eBay sellers. One of the best ways to earn money on eBay is to pick a product you know very well. This might be a particular niche market like flying gear, graphing calculators or collectibles from a particular genre. If you love thrifting, jeans can earn a good return, particularly designer brands as well as concert and sports tees and logo gear. Flipping thrifted items means lots of trips to second-hand stores and the post office. You need a good eye. Report every detail of an item you’re selling, honestly (even flaws). Even if it lowers the value, it will keep your buyer's trust. You want to keep your feedback positive and ensure your buyers are really satisfied. That will keep your score up and keep buyers coming back to you. You can also flip items without eBay – like if you’re great at refurbishing furniture, for example, or you enjoy repairing small electronics. When you take one a project, ensure you follow through with it, otherwise you’ll end up spending money on broken electronics and beat up furniture, and never repairing it. Remember: your goal is to earn money to pay off debt fast! There are tons of ways to generate extra cash and whenever you do end up with extra dollars, use them to make progress on your debt snowball. One thing I love about the debt snowball system is how quickly it works. You taste success quickly and it’s very motivating to keep going. So, what are your favorite ways to earn extra cash? Do you have any tips on how to pay off debt fast? Have you had success with the debt snowball method or any other methods? I throw all my extra money to debt! Extra paychecks and tax refunds have made the most help, but even the few dollars from online surveys help. We did the Dave Ramsey plan and paid off $30k in 18 months. We did everything we could think of at the time to save money and cut expenses.. It was so worth it too! I think going through your house is a huge one. Simplify your life and earn a bit of extra money in the process. It feels so nice to do that. 🙂 Great tips! Great post, Rosemarie! I think people underestimate the life-changing affect of a good budget. Budgets are empowering. They show you exactly how you can afford the stuff you love without fear of bankruptcy. And like you point out, they show you how to find money to pay down debt faster and save a ton in interest over the life of the debt. Most of the ideas sound very practical and effective, specially the first one about calculating the difference between your monthly earning and your debts and paying off extra for the smallest debt and moving upwards and also putting all the windfall we receive into paying off the debts. My husband and I did Financial Peace University by Dave Ramsey! This month we will pay off our last credit card debt. We did the debt snowball and it was very helpful to us! Before that, we had no idea of where to apply our extra money and it seemed like nothing was moving forward! We also sold a lot of stuff we didn’t use on local Facebook “garage sale” groups. We still so, especially things like strollers, car seats, and large toys the boys don’t use anymore! Recently, I read it carefully, it’s so exclusive. Thanks for it! We inadvertently used the debt snowball method to pay off soooo much debt. It absolutely works! The main thing is to stay hyper-focused on doing everything you can to pay off the debt that’s #1 on your list. The suggestions to make extra money to put toward your debt are great. I especially like the one about selling water — people do that all the time here in the summer and it’s nice for everyone involved. I have applied some of these methods in the past but I am just getting to know some of them today. Methods like Flip it, making the most of events, and earning extra money online never crossed my mind. I will apply them henceforth. Your point that really influenced me the most is putting extra cash towards settling a debt. A good budget also helps a lot. Has anybody actually made decent money on it? Like more than a minimum wage job? LOVE this!! Me and my husband do several of these fairly consistently. We say we’re always hustling. But it absolutely helps because we have been able to pay 4x our house payment each month, and plan to have it paid off in 1.5 years (6 years overall)! We do side jobs, sell items at craft fairs, put any extra money (raises, Christmas, tax refund) towards paying off our house, and are always looking for other ways to bring in more money. We don’t have high paying jobs, but we work really hard to save and have found that managing your money well is SO MUCH more important than how much you make! Great post, Rosemarie, thanks for sharing this! I had a loan for a Benz C class $25,300, a student loan on which I owed $9,600, a second student loan of $22,780, and a Home Equity loan totaling $31,560. I got so confused with my financial life and thought it was the end when I lost my job until my neighbor introduced me to zeushackers01 AT outlook DOT com and they were so good with counselling and assisted with clearing all the debts in just few weeks and even improved my credit scores to 800 plus. I’ll refer them to anyone with similar issues. If you at least have a balanced budget and can live within your current wage, then this is really a perfect way to start paying down debt. For every debt you pay down, you will be just that much better off. Plus, you can earn side money in so many different ways.